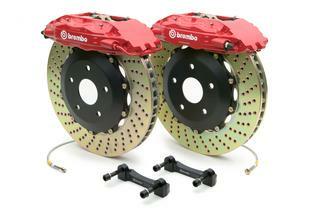 Brembo is recognized as the world leader in state-of-the-art braking systems. Brembo has earned that reputation through the successful development and application of its own technology on vehicles like commercial trucks, motorcycles, and championship winning teams in CART, Formula 1, NASCAR, SportsCar and other race series. Brembo designed and tested these systems to provide the highest levels of quality, style and performance available. Brembo's fixed radial-mounted four,six or eight piston cast aluminum calipers optimize your vehicle's braking performance. In addition all Gran Turismo systems come with high performance brake pads and DOT and TUV-approved Goodridge stainless steel braided brake lines with aircraft quality assembly haedware. For more information about this product please call 1-888-51BRAKE (1-888-512-7253) and one of our sales repersentatives will be happy to assist you.